I've recently partnered with the great folks at Hidden Valley®, and I'm very happy to bring you some tasty ranch-inspired goodies. 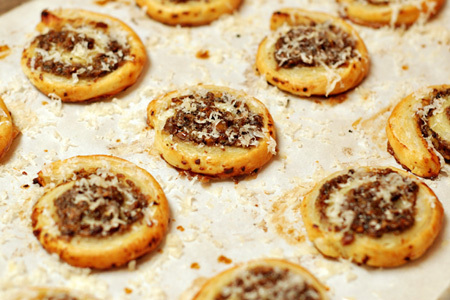 First up is a light but savory appetizer that is perfect for your holiday celebration. Let's face it, the holidays mean that we'll all likely be eating more than our fair share of good food. All great meals, get-togethers and parties start with family, friends, and plenty of finger foods. Here's an easy crowd-pleasing appetizer that will impress your guests without filling them up. These pinwheels are very simple, but your guests will think that you spent a ton of time making them. They combine the savory goodness of sauteed mushrooms with just a touch of that familiar ranch flavor in light and flaky puff pastry. Heat a large saute pan over medium-high heat. Add the butter and heat just until it starts to foam, then add the olive oil and heat 30 seconds more. Add the shallot to the pan and cook one minute. Add the mushrooms and garlic and cook until the mushrooms are tender, about 10 minutes. Remove the pan from the heat and add the ranch mix and pepper. Set aside and let the mixture cool 15 minutes. Note: You can make the mushroom mixture the day before. Refrigerate it and let it come to room temperature just before you are ready to use it. Preheat your oven per the puff pastry package instructions, typically 400º. Unfold the thawed puff pastry according to the package instructions. Spread an even layer of the mushroom mixture to about 1/8" thick across the entire puff pastry sheet, leaving about 1/2" margin around the edges. Whisk together the egg and water in a small bowl and brush the edges of the pastry, reserving the remaining egg mixture. Gently roll the pastry in a jelly roll fashion. 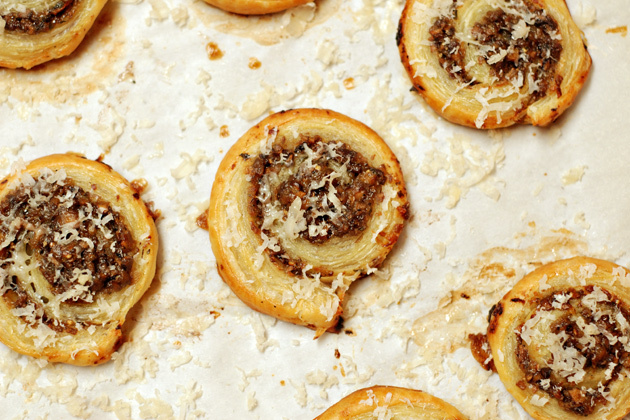 Cut the roll into 1/2" slices and place them 1 1/2" apart on a baking sheet lined with parchment paper. 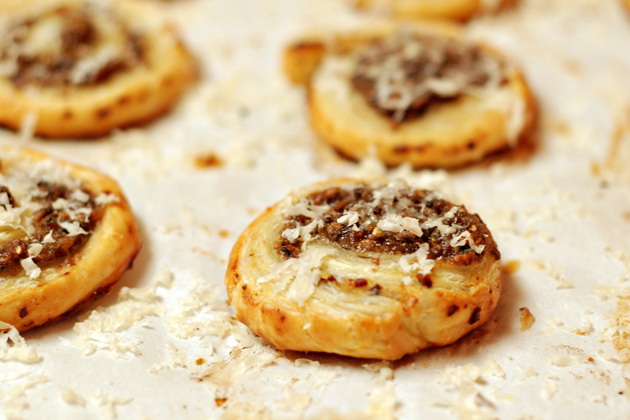 Brush the top and edges of each pinwheel with the egg mixture. 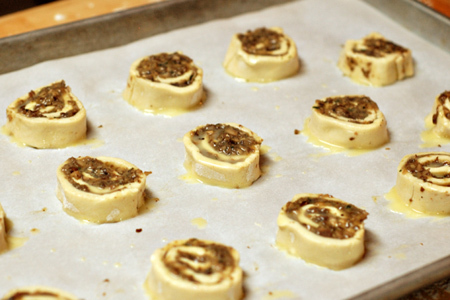 Bake the pinwheels until they are golden brown, about 15-20 minutes. Remove the pan from the oven and let cool about 10 minutes, then sprinkle the top of each pinwheel with the cheese. Note: If you have leftover mushroom filling, just mix it with some soft unsalted butter to make an outstanding compound butter to top a steak, baked potato, or to add a new dimension to garlic bread. It will keep in the refrigerator for at least a week. Fun appetizer, can't wait to try it!